Details follow below for Falcone and Mathewson (also scroll down, with headshots and actions of all 16 included on this page). 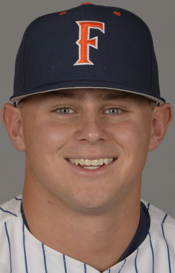 In addition to Falcone and Mathewson, the other week-3 Primetime Performers include: Oregon jr. 1B Brandon Cuddy (Tulsa, OK) … Rhode Island so. 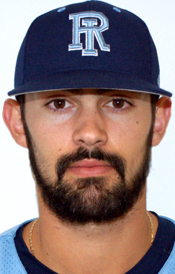 RHP Lou Distasio (Yarmouth, ME) … CS Fullerton so. 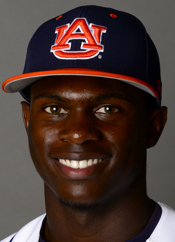 1B Josh Estill (Carlsbad, CA) … Auburn so. CF Anfernee Grier (Phenix City, AL) … Nebraska sr. 3B Blake Headley (Omaha, NE) … Louisiana-Monroe sr. RHP Alex Hermeling (Northbrook, IL) … San Diego jr. RHP David Hill (Orange, CA) … UCF jr. LHP Harrison Hukari (St. Petersburg, FL) … UCSB jr. LHP Justin Jacome (Redlands, CA) … UConn so. 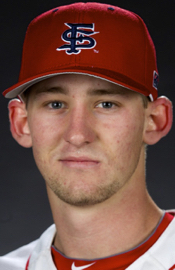 LHP Anthony Kay (Stony Brook, NY) … Louisiana-Lafayette fr. 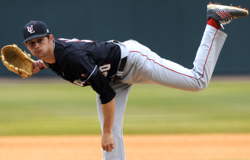 LHP Gunner Leger (Lake Charles, LA) … Georgia Southern so. 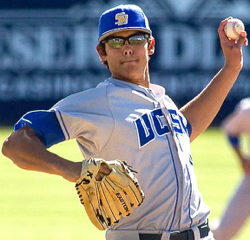 LHP Jason Richman (Alpharetta, GA) … San Diego State jr. SS Danny Sheehan (Covina, CA) … and Fresno State jr. C Taylor Ward (Oviedo, FL ). The 16 week-3 Primetime Performers include: nine pitchers (six of them LHPs) and a pair of first basemen, plus a catcher, shortstop, third baseman, centerfielder and DH. Six of the honorees are juniors, plus five sophomores, three seniors and a pair of freshmen. The 16 include five who hail from California hometowns, plus two each from Florida and New York, and one each from Alabama, Georgia, Illinois, Louisiana, Maine, Nebraska and Oklahoma. 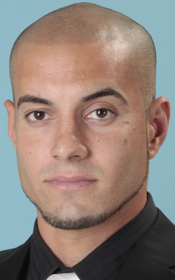 FALCONE – who spent six years as a Marine Corps medic –led the way for a Columbia offense that was hitting outside for the first time all season and opening its 2015 campaign with a challenging 4–game series at the University of Houston (cb360 #6). 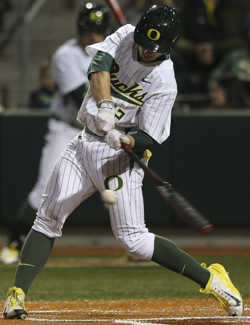 After losing their season opener 3–0, the Lions went on to earn a split of the series and easily could have won 3-of-4 (the Cougars rallied to win gm-3, 8–7, after trailing 7–5 in the late innings). 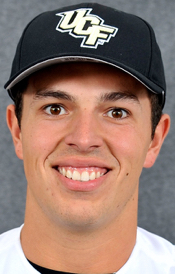 From his spot near the bottom of the batting order, the lefthanded-hitting Falcone batted at a .500 clip in the series (7-for-14) – with all but one of those hits going for extra bases, highlighted by a pair of home runs plus four doubles. His huge first week also included seven RBI, four runs scored, eight total times on bases (once via a hit-by-pitch), no strikeouts and a lofty 1.767 OPS (.533 on-base plus 1.214 slugging pct.). 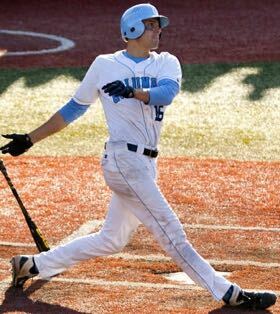 Columbia senior DH Joey Falcone hit 7-for-14 with two home runs, four doubles, seven RBI and no strikeouts in a 4-game series split at Houston – as the Lions opened their 2015 season in impressive fashion. Four of Falcone’s hits in the series came on first-pitch offerings and the imposing 6-foot-5, 225-pound lefty amazingly saw only 10 total pitches across his seven hits. Only once did he collect a hit when ahead in the count (1–0, with the other two coming on 0–1 counts). In Columbia’s season opener, Falcone stroked a pair of doubles against Houston’s ace, Andrew Lantrip, but he was left stranded as the rest of the Lions team hit only 4-for-29. 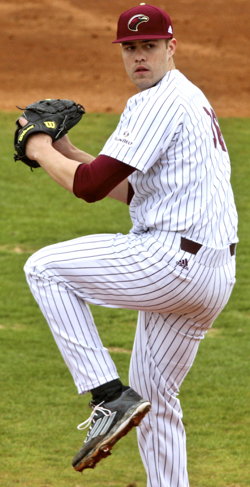 Then, in the first game of a Saturday doubleheader, the former Marine was hit by a two-out pitch – leading to pair of early Columbia runs – and he later led off the 7th (versus another high-end starter, Jake Lemoine) with a first-pitch home run to center field in one of his two official at-bats, yielding a 3–0 lead (the Lions went on to win, 5–4 in 13 innings). 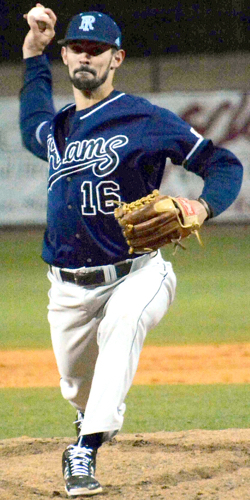 Falcone’s 2-for-4 effort in the nightcap helped stake Columbia to a 7–5 late-game lead. 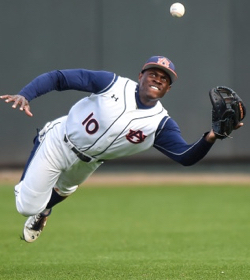 He jumped on another first pitch for a clutch hit in the 4th inning of gm-3, sending a 1-out/2-run single into center field as part of the Lions three-run sequence. In the 6th, Falcone went the other way on yet another first-pitch from Garza, doubling down the leftfield line for a clutch two-out hit. In the Sunday finale, the veteran DH’s 4-RBI day (2-for-5, 2 R) included delivering a key game-tying double in the 4-run top of the 5th – on a 1-out, first-pitch shot to center field. Finally, in the 9th and ahead in the count for a change, Falcone drove a 1-0 pitch over the centerfield fence for a two-run blast and some insurance runs (10–7; 12–7 final). 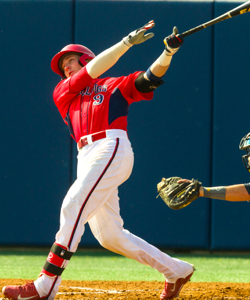 Falcone had a breakout sophomore season in 2013 – batting .331 with five home runs while earning ABCA second team all-Northeast Region honors. 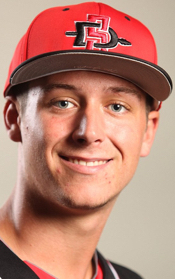 He slumped in 2014, after not playing 2013 summer ball – but the senior DH could be back to his stellar form, after a strong 2014 summer playing for the league champion Monmouth Monarchs of the wood-bat ABCCL (.330, 23 RBI). 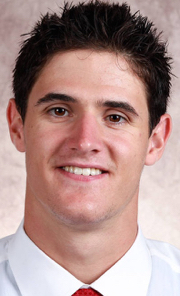 He has helped the Lions win the Ivy League title and advance to the NCAAs during each of the past two seasons. Following his prep career at Bolton High School, Falcone opted to enter the military and ultimately served for six years, including three tours in the Middle East as a combat medic (Corpsman) in the USMC Infantry. His father Peter Falcone enjoyed a 10-year Major League career (’75-’84), as a lefthanded pitcher with the Giants, Cardinals, Mets and Braves. CLICK HERE for an in-depth 2013 feature story on Joey Falcone. 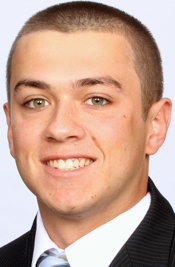 Freshman Chris Mathewson – who grew up 25 miles east of Long Beach, Calif. – tossed seven strong innings to front the first no-hitter in Long Beach State history, versus potential NCAA Tournament team Wichita State. … MATHEWSON – whose name coincidentally is similar to that of (inaugural class) Hall of Fame pitcher Christy Mathewson (some quick notes on that baseball legend, who played college baseball at Bucknell, are included below) – potentially could emerge as the ace of the Long Beach staff, but his early-season work has been limited due to undergoing knee surgery in January. 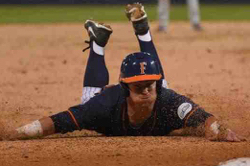 In the 4–0 series finale versus a quality Wichita State team, Mathewson struck out eight, did not allow a runner past first base, yielded only four balls out of the infield, and walked only one (plus two hit batters), before handing things off to fellow freshman RHP Darren McCaughan. Due to his return from surgery, Mathewson was limited to a mid-80s pitch count but nonetheless laid the foundation for the historic no-hitter – amazing a first in the storied history of Long Beach State baseball. 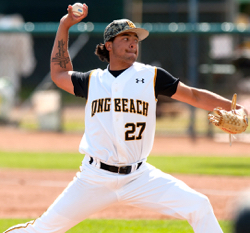 Past LBSU pitchers have included the likes of Jered Weaver, Jason Vargas and Cesar Ramos – who all pitched together, how about that rotation – along with other former Dirtbags pitching greats such as Steve Trachsel, Vance Worley, Brian Shaw, Abe Alvarez and Marco Estrada. Wichita State entered the series at Long Beach State with a .308 team batting average and nearly 11 hits per game, after playing series against legitimate opposition – at Sam Houston State (2014 NCAA tournament team and 2015 Southland Conf. favorites) and at home against a Texas State team that is expected to push preseason favorite Louisiana-Lafayette in the Sun Belt this season. Wichita State is considered by many outlets to be a potential 2015 NCAA Tournament team and is projected to challenge Dallas Baptist for the Missouri Valley Conference title. Mathewson retired the first 11 batters he faced and set down six straight to cap his outing. McCaughan then closed the no-hitter with a pair of 1-2-3 innings, consisting of three strikeouts and three groundball outs. Wichita State sent only 28 batters to the the plate (one over the minimum), with two midgame runners erased on the bases. Mathewson kept the ball low in the zone, producing 17 of his 21 outs that stayed in the infield: eight Ks, four groundball outs and three infield popups/foulouts (plus the pair of runners thrown out). 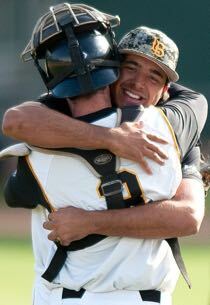 Chris Matheson embraces catcher Eric Hutting, after the first no-hitter in Long Beach State baseball history (4–0 vs. Wichita State). After striking out the side in the 3rd, Mathewson hit Ryan Tinkham with a 2-out pitch in the 4th – but that was the extent of the damage, as the next batter flew out to right. 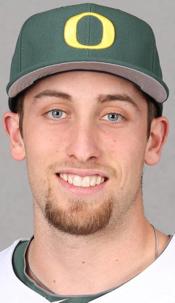 Then, in the fifth, the rookie pitcher plunked Daniel Kihle to lead off the inning – but catcher Eric Hutting gunned down the runner when the ensuing breaking ball was in the dirt (a potential wild pitch that became a 2–6 putout). Later in the top of the 5th, Tanner Kirk drew the only walk of the game (by either team) – but Hutting again erased the threat, this time on a straight caught stealing (2-to-4). Mathewson and McCaughan then combined to retire the final 12 Wichita State batters. 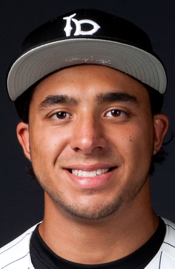 The Shockers best chance at a hit came in the 4th, when Michael Mucha’s gapper to left-center had a chance – but centerfielder Joey Sanchez executed the diving catch, an “asterisk-worthy” play as things would turn out. Mathewson played his pre-college ball at Kaiser High School, in Fontana, about 25 miles east of Long Beach. CalHi Sports tabbed him its 2014 player of the year for “medium-sized” schools. 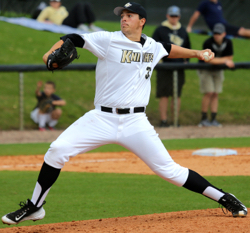 Also a 2014 second team All-American (per MaxPreps), the 6-1, 190-pound Mathewson was a two-way player at Kaiser, with his senior season including a 0.79 ERA, 9–2 record and 105 strikeouts in 62 innings (also hitting .511 with 33 RBI) – after a 0.95, 9–0, 114–K junior season. 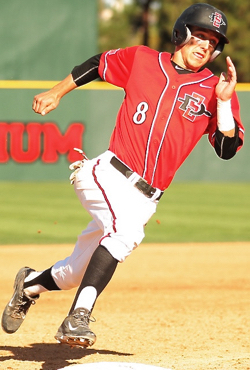 Despite Mathewson’s firm commitment to Long Beach State, the Texas Rangers took a chance by selecting the Fontana product in the 28th round of the 2014 MLB Draft. Christy Mathewson – one of five inaugural members of the Baseball Hall of Fame – was a baseball and football player at Bucknell University, in the late 1800s. Side Note: Inaugural Hall of Fame class member Christy Mathewson played both baseball and football at Bucknell University, in the final years of the 19th century. 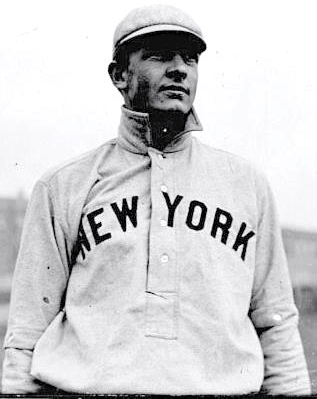 He went on to rack up 363 career wins, primarily with the New York Giants from 1900–16. A native of Factoryville, Pa., Mathewson was accidentally exposed to chemical weapons while serving in the Army’s Chemical Warfare Service during World War I (that exposure likely led to him contracting tuberculosis and dying in 1925, at the age of 45). A devout Christian, Mathewson never played sports on Sunday. He was extremely well-liked throughout baseball and noted for both his intellect and great sportsmanship, in addition to writing various newspaper columns and books later in his career. During his own legendary career, manager John McGraw trusted only one player as a de-facto player-coach/mentor for the younger members of the team: Mathewson. The other four inductees from the inaugural Hall of Fame class in 1936: Ty Cobb, Walter Johnson, Babe Ruth and Honus Wagner. * Falcone is the CB360 National Primetime Player and Mathewson the Primetime Pitcher of the Week. 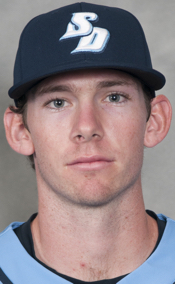 Rhode Island … RHP … So. 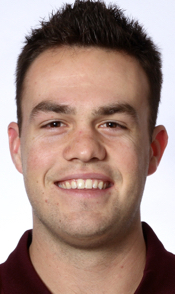 Louisiana-Monroe … RHP … Sr./Jr. 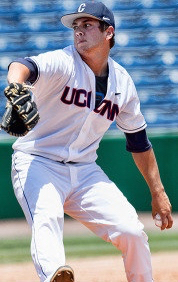 San Diego … RHP … Jr.
UCF … LHP … Jr.
UC Santa Barbara … LHP … Jr.
Connecticut … LHP … So. Louisiana-Lafayatte … LHP … Fr. 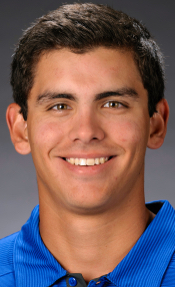 Long Beach State … RHP … Fr. 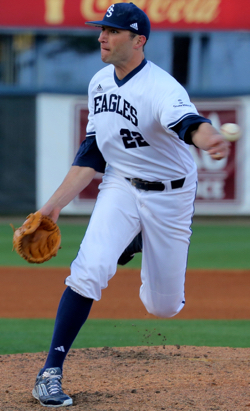 Georgia Southern … LHP … So.